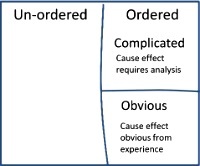 The purpose of this paper is to introduce the Cynefin model and its practices which can be used to address the uncertainty of the modern world. The practices that are introduced can be used to compliment traditional approaches to programme and portfolio management. This provides a more comprehensive approach that reflects the needs of management in an ever more uncertain world. We have seen a couple of books appear on the issue of uncertainty over the last decade but neither have a comprehensive framework that allows us to deal with the increase in uncertainty of the modern world. If anyone is in doubt that traditional models are struggling to deal with modern market dynamics they only need to look at the demise of Monitor Group. This was Michael Porter’s, the father of strategic analysis, company and used his market model. His approach was based on rigorous analysis of market forces and the assumption that this leads to a rational structured approach that would result in a competitive advantage. It has become apparent that it could “help explain excess profits in retrospect, it was almost useless in predicting them in prospect.” Stewart notes “Most successful strategies emerge through action; they become perspicuous only in hindsight.” Lafley and Martin also note that it is not this simple and it is an increasingly complex, global, and competitive world. . What we’ve learnt is that there are limits to rationality but how can we address uncertainty and take advantage of turbulence in the market place? When we are faced with a problem, we assume that all we need to do is elaborate the options, select one, and then execute. This makes the assumption that causality is determinable and therefore we have a valid means of eliminating options. What we mean by causality is that we can relate cause and effect; if we take a certain action we know what the effect will be or given an effect we can determine what caused it. This is not always the case and as we need to acknowledge that there are systems in which cause/effect can be determined and those in which it cannot. We call the former ordered and the later un-ordered1 systems2. In an ordered system, the system is highly constrained, the behaviour is highly predictable, and the causality is either obvious from experience or can be determined with the right expertise. If we have seen the cause or effect before what is happening is obvious then we have a simple system and if it is not obvious, but can be determined by analysis, we say it is a complicated system as cause and effect (or determination of the cause) is separated by time. 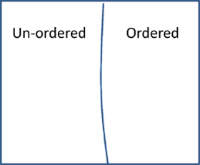 For an unordered system causality cannot be determined but we find that there are systems that are stable and the constraints and behaviour evolve over time through the interaction of the components. Here causality can only be determined in hindsight and no amount of analysis will allow us to predict the behaviour of the system. This domain we call complex but there are also some systems that are not stable and can only be described as chaotic, as there are little to no constraints and behaviour is random. There is one additional domain that needs to be considered, which is that of systems that we have not yet determined and we put these in the disorder bucket. Another definition that can be applied is that systems that are ordered can be taken apart and put back together again. For example a car or an aeroplane - while those that are unordered can never be ‘deconstructed’ and then put back together again. For example think of making mayonnaise. We also need to acknowledge that systems are not always stable and the state of the system may change over time. A system may be stable one day and we believe we know how it works. However we may find that its performance is degrading overtime or it may simply break. In the case of the former, we may have to involve an expert (say a mechanic in the case of a car) to analyse what is going on. In the case of the later, where a car has broken down and we have been thrown into chaos, we may need to involve a rescue service to recover the vehicle and take it to a garage in order for a mechanic to undertake the analysis. We have moved from simple (driving the vehicle) to chaotic (the vehicle is broken) to complicated (we need a mechanic) to return hopefully to simple (the car is again working). 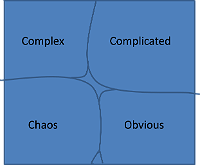 These domains of obvious, complicated, complex and chaos, along with disorder (not yet determined) are the domains of the Cynefin complexity model. 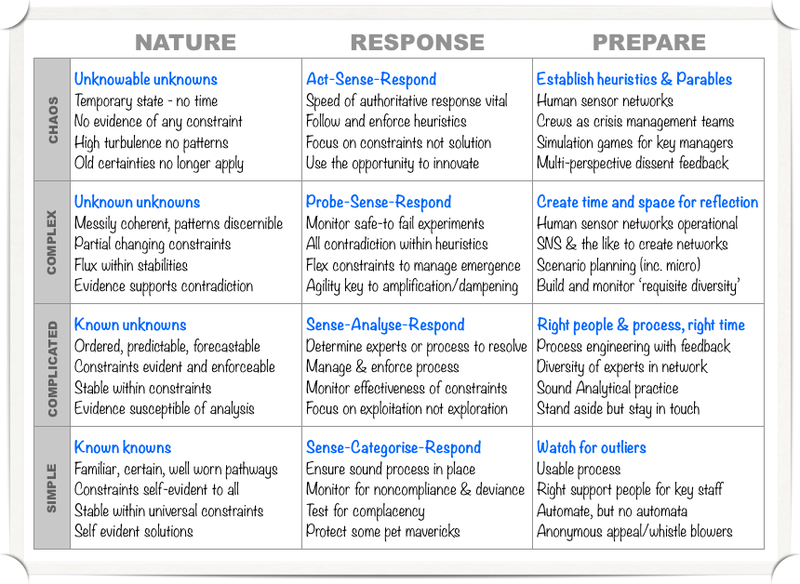 It gives us both a model that allows us to describe reality, as well as some practices that can be applied to manage in the complicated and complex domains. These practices are more suitable and complement the traditional approaches that are applicable where order holds. It is not a case that the old practices didn’t work but realising that they only work within certain boundaries and if we are not in an ordered space they are not applicable. Obvious3 (known knowns) – here we know what we are doing and have seen it a thousand times before, so we sense, categorise and respond (S-C-R). Here we expect to see best practices employeed. Complicated (known unknowns) – we don’t know what is going on but know that we can analyse what has happened and work it out, so we are sensing, analysing and responding (S-A-R). This is the domain of good practice. Complex (unknown unknowns) - we cannot determine what will cause a particular outcome but we can run some experiments to see if they move us in the right direction so we probe, sense and respond (P-S-R). This is also the domain of multi-hypothesis as there is no right or wrong answer so we may want to run a series of experiments or in fact run a number in parallel. This is the domain of emergent practice. Disorder (not determined) – these are the items that we are yet to determine in which domain they belong. The first thing we need to do is to differentiate between order and un-order – have we seen this before or have any experience that can be leveraged; if so the problem is ordered. If we haven’t seen this before and it is truly novel, then this is something that we may be better of exploring first; therefore we treat it as un-ordered. If there is no more time to consider which domain we are operating in then we should consider the worst case, not the most simple, which means that if is ordered then deal with it as complicated; and engaged experts, and if un-ordered then treat it as chaotic and act in an attempt to stabilise the situation. This avoids over simplifying the situation and fooling yourselves that we know the answer only to find we don’t. Group think/naivety – the issue with the complicated domain, the domain of experts is that there is a tendency towards group think. There is value in groups as evidenced by the ‘wisdom of crowds’, which is based on the average view of a group of experts/experienced people in the area but one of the key point is that the individuals are not allowed to engage with each other. The requirement is that the guesses are not to be disclosed to each other and that each estimate is made in isolation to avoid influencing each other’s guesses. This is not necessarily practical on a day to day basis so we need an effective strategy to address this and to improve information scanning. Alfred Sloan said - "Gentlemen, I take it that we are all in complete agreement on the decision here. Then, I propose that we postpone further discussion ... to give ourselves time to develop disagreement and perhaps gain some understanding of what the decision is all about”. The issue of group think can be addressed by engaging diverse groups of individuals and ensuring that some of these come from other domains of expertise and therefore provide a naive view. The mantra is that there are no dumb questions but you need people who are willing to ask such questions. This can be provided by engaging experts from diverse domains. It is worth noting that Franklin D Roosevelt dragged people from one meeting to another if they were bright and he thought that they would provide an interest point of view [Decisive]. Dave Snowden tells a story of the engagement of anthropologists to undertake the study of the management structure of a hotel chain. This gave rise to an interesting chapter in the report on the mating habits of the staff. This is what we should consider when you engage the experts. Conflict Resolution: The use of multi-hypotheses is also a useful technique for conflict resolution. The hypotheses can be outlined and experiments run to determine which are validate and should be progressed. It may be a case that opposing ideas have validity and have benefit. See the portfolio forms is the second article for an outlined of the experiments. Multi-hypotheses –we have talked about there being no clear ‘answer’ in the complex domain which means that we will have competing views. Remember, in this domain cause and effect are not directly related so we have messy coherence and may be able to ascertain patterns forming over time. We need to understand and accept that this is not bad in itself and sometimes it needs to be embraced. This means that you are not looking for the right answer but a series of ideas that can be ‘tested’ to find out what works as more than one idea may be viable. We mentioned before that the complex domain is the domain of multi-hypotheses so what you are seeking is a number of experiments that test the hypotheses and maximise the potential for learning. There is a good example in the Heath’s Decisive where they discuss the example of the largest direct car sales company in America. This started out as an experiment to see if people would consider buying cars online and the response was overwhelming. The initiative was initially withdrawn as they were losing money as the trial model was based on purchasing the cars to meet the orders. This type of issue is going to become more common in the future and we need a more flexible and comprehensive model. Again naivety has a role to play as you can’t assume that you know what will happen. As long as someone can make a coherent argument, thier idea has value and should be explored. Obliquity – The last point to make is that of the need to recognise the value of obliquity, which is the practice of achieving objectives indirectly. You may be aware that Apple doesn’t focus on traditional management measures as it uses Net Promoter Score (NPS) to assess satisfaction from the customer perspective. It uses this to guide its product development and marketing efforts. It does make use of traditional metrics internally but these are not targets in themselves. To expand on this I’ll use an example from sailing. When sailing upwind, or downwind you are trying to get to the next mark as quickly as possible and the common ‘metric’ that is used to indicate progress is VMG (velocity made good) as you cannot sail directly into the wind (although you can sail directly downwind it is not an optimal point of sail). The issue is that VMG is a direct measure that doesn’t take into account all the other variables that are in play such as wind strength, point of sail etc so what we typically use is an oblique measure which is that of target velocity. The boat’s performance characteristics are used to determine the optimum speed given the wind strength and point of sail. The helm then steers the boat based on these indirect measures which leads to optimisation of the VMG to the next mark (I would expect the navigator to have VMG on his instruments but not for it to be displayed on the main instruments so the helm is obvious to the direct measure)4. What we ideally want to use is an oblique approach as this avoids the cognitive bias that comes from using a traditional measure which can be gamed. This is explored in John Kay’s excellent Obliquity: Why our goals are best achieved indirectly. 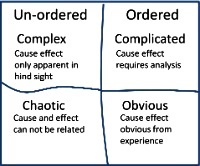 Cynefin provides an approach and a set of practices for addressing uncertainty which management today are increasingly facing. This provides them with the means to realise that they are facing a messy, intractable problem, and the tools to enable them to make progress in this imperfect world. This is a significant change over the more traditional approaches which try to reduce a problem to a set of rational actions and acknowledges that in some instances we cannot predict the outcomes. Instead of obsessing about predicting the future, we can move to a position of controlling the future, therefore, we don’t need to predict everything. This is the value of Cynefin. The next paper considers the practices related to the running the experiments. Greg Brougham is an experienced systems and technical architect specialising in card and payments system. He has worked on the renewal of the main UK domestic clearing and settlement system and also a similar system for one of the major card companies. It was while working on the later in the mid 0’s that he thought that there must be more effective means of delivery than the prevailing approaches that were preoccupied with utilisation. This led to a review of the prevailing management literature and an interest in Theory of Constraints, Systems Thinking, Toyota and more recently complexity (in particular Cynefin) and the cognitive sciences. I enjoyed your article Greg. It's the best introductions to cynefin I've read. I look forward to part 2.